The tool-and-cutter grinder is commonly used in tool shops everywhere to create special cutters and sharpen all types of carbide cutters. These little machine tools use cup grinding wheels that can last for years, if properly used and maintained. The diamond used is grown on industrial scales to supply the voracious appetite of the metal working industry worldwide. These diamonds are more uniform in hardness and shape than natural diamonds, so they are ideal for industrial applications. Diamonds are considerably harder than conventional abrasives, such as aluminum oxide or silicone carbide. They do not work well at all for ferrous metals because the carbon is soluble in iron at high temperatures. The stamping industry commonly uses carbide to make the die components. These dies are capable of producing up to a million parts without wearing out. In the past, carbide grinders were used exclusively to build these amazing production tools. Then the wire EDM was invented and all that changed. What used to take days to produce can now be done in a matter of hours, with no sacrifice in quality or accuracy. Shops conducted their own, independent tests to compare the two processes, and found that there was virtually no difference in accuracy. WEDM performs nearly the same whether the material is steel or carbide. This is a huge advantage because carbide is quite difficult to precision grind. 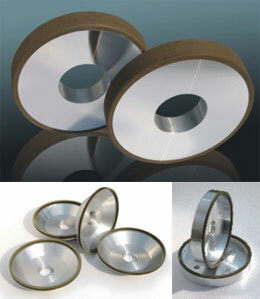 There are numerous applications for diamond grinding in mass production. Aerospace machining, optical grinding, automotive production, bearing grinding, shaft grinding, medical machining and ceramic grinding are a few of the processes that use diamonds. While these industries are not directly related to toolmaking, there are spin offs, nevertheless. One example is in the production of carbide milling cutters and carbide inserts. Companies such as Sandvik, Seco, Iscar, Ingersoll, and Niagra all use diamond wheels to manufacture their cutters and inserts. These are the real workhorses of any toolmaking shop. Companies such as Deckel, Walter and Ewag make very high quality tool and cutter grinders that use diamond wheels, as well as CBN wheels to produce carbide cutters. The CNC tool grinding machines available are capable of extreme accuracy. With the powerful software integrated with the design and machining, almost any cutter configuration imaginable can be produced to tight tolerances. Many medical applications are also done on these CNC machines, such as implants, and orthopedic parts. These are the products that almost nobody thinks about, yet they are important in our everyday lives. If you have ever used a micro end mill, you will appreciate the fact that such a thing is even possible. When you look at a .010 in./.250 mm end mill and imagine grinding the flutes and cutting edges, the respect for these carbide grinders escalates dramatically. Some cutters even have a flushing hole down the center! The world of the miniature is almost bizarre in what can be done. Technology continues to advance, materials are improved and the machines are more stable, faster, and have more features than ever before. This trend appears to have no end in sight and offers great opportunities for the right person.